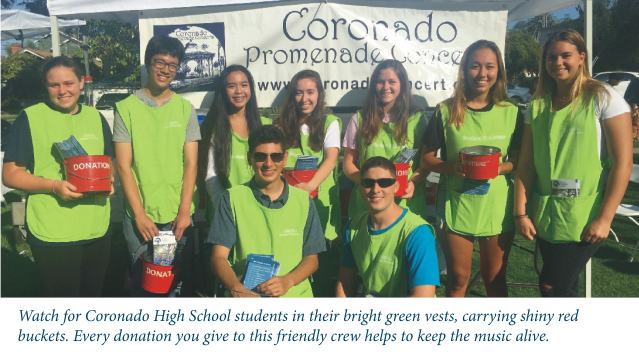 At every Concert in the Park an energetic, personable and highly motivated group of Coronado High School students scatters through the crowd to accomplish a mission-critical task for our concert series. Dressed in lime green aprons and toting shiny red donation buckets these members of the National Honor Society perform an essential function, raising funds at the grass roots level. The Red Bucket Brigade made its first appearance in the summer of 2013. Every summer since then the teams have each worked hard to do a little better than the prior year’s squad. By and large they have all succeeded. As a result the Brigade has become an indispensable part of our organization, which receives no public funding. Today nearly one of every five dollars donated to our organization comes to us in a red bucket. The Red Bucket Brigade does more than raise money. Team members also serve as our goodwill ambassadors. It’s likely that a member of the Red Bucket Brigade handed you this copy of our official program. Perhaps one of them answered your questions about the concert, or about the park or the community. Take a few minutes and talk to one of these great kids. And please thank them for their service. They are truly helping to keep the music alive.